A Felpham family have to 'rebuild their home and lives' after a 'devastating' fire over the weekend. 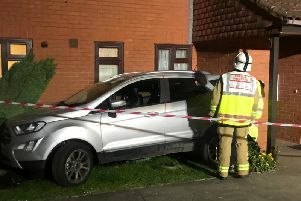 At home was mum-of-three Ginnie Mason and two of her children, with her eldest son raising the alarm to Ginnie's dad Chris, who lives next door. Chris said: "The fire started late on Saturday night. The eldest was in the garage, and as he walked back into the house, he saw smoke through the kitchen door. "He shouted and I realised what the situation was and put the ladder up to the back window where my daughter and the children were and they came down to safety. "They then had to stand at the front of the house in the pouring rain watching their home being burned to the ground. It is distressing. My daughter is so upset and it is so difficult. "It's very difficult watching it happen to my daughter. Her world fell apart on Saturday night and that was difficult to watch." A fire service spokesman said crews spent nearly eight hours tackling the blaze, which caused 100 per cent damage to the ground floor by smoke and heat. 100 per cent of the first floor was damaged by smoke, whilst 50 per cent of the roof was damaged by fire. Crews remained at the scene to cut away and damp down, and left 8.13am. "It was an absolute stroke of luck [that it was discovered when it was]," Chris said. "We now have to deal with the aftermath. It's great that I live next door but my daughter has to see the state of her house everyday. "We are just trying to come to terms with it. It is a terrible situation. We are just getting on with it. We've lost possessions, photos, the usual stuff. They are lost forever and that's something we have to deal with. It's far too early to say exactly how much they've lost. "It's not just fire damage as most of the house is covered in smoky soot. It's like someone walking into a room and spray painting the whole thing in black." Family friend Tracey Arnell has set up a fundraising page with a target of £15,000 to help the family get back on their feet. She said: "Our wonderful friends Ginnie Harper (Mason), Jason Gibbons and their family have had their world turned upside down as a blaze that started at their house has destroyed their home. "Ginnie and her family managed to get out safely and are staying with friends and family following this devastating incident that has resulted in the family losing their home and possessions. "The family have now found themselves at the beginning of a journey to rebuild, not only their home but their lives. Chris said the fundraiser has been a 'big comfort and a massive help'. He added: "We have to pick ourselves up and get on with it. "It's amazing to look at the thoughtfulness and niceness of people just to put a bit of money on there. We can't thank them all, unfortunately. We would very much like to. "It's emotionally supporting that you know that people are routing for you. It means a lot to Ginnie and the kids. They are living with me at the moment. It will be a couple of months before they get back in there. "Tracey is a very close family friend and her husband is a carpenter so he has helped us out. The neighbours have been superb as well. They have all come out, asking if we need anything, offering for us to stay over. It was pouring down with rain for hours and hours. "It was heart warming. They have been absolutely brilliant. People have been dropping in with food and clothes." Nick Gibb, MP for Bognor Regis and Littlehampton, reacted to the news of the house fire. He said: "My thoughts are with the family whose house was severely damaged by fire this Saturday evening.